I have met folks from Bird Clubs and have spoken at their meetings. They keep caged birds – parakeets, parrots, finches, canaries, and so on. The majority of these bird species have been bred in captivity for many years. The same with pet shops; most birds for sale are cage bred. I am not a big fan of keeping animals of any kind in cages simply for our pleasure, but if they are cage bred and held in spacious, sanitary, and healthful conditions, then I have little opposition. There are some excellent zoos that do a terrific job of keeping and caring for their avian charges, such as the San Diego Zoo. I’ve been to many aviaries, zoos, and other places that display birds, but more often than not I have been disappointed by the conditions the birds are kept in. The biggest threat to a number of non-native bird species is the pet trade. Legally and not, many wild birds are caught and imported to the U.S. Over 60% of the 500,000 legally imported wild birds die before they get to their destination. Illegally caught birds are smuggled in suitcases, coats, jars, plastic tubes, etc., not fed or given water for a day or two, resulting in a death rate that may exceed 90%! Over 30% of parrot species are endangered, largely due to the pet trade. I have seen a dozen or more large parrots in captivity in homes – few were kept in satisfactory conditions. They were restricted to small cages, fed human food, surrounded by dogs, cats, screaming kids, blaring televisions, or some such environment. At best, they were allowed to fly around the living room. The owners pay little attention to them but seem proud of the fact that they paid some outrageous price for these living jewels that might say a few words to entertain guests. Importation of a particular caged parrot likely cost the lives of many others in the process. I believe it is time to give up our wild-caught pets and try to appreciate their roles in the natural environment; parrots and cockatoos belong in the habitats of Costa Rica, Australia, or wherever, not in a residence. Dogs, cats, hamsters, parakeets, and cockatiels should be more than enough to satisfy the urge to have a pet. Birds should be enjoyed in the wild. 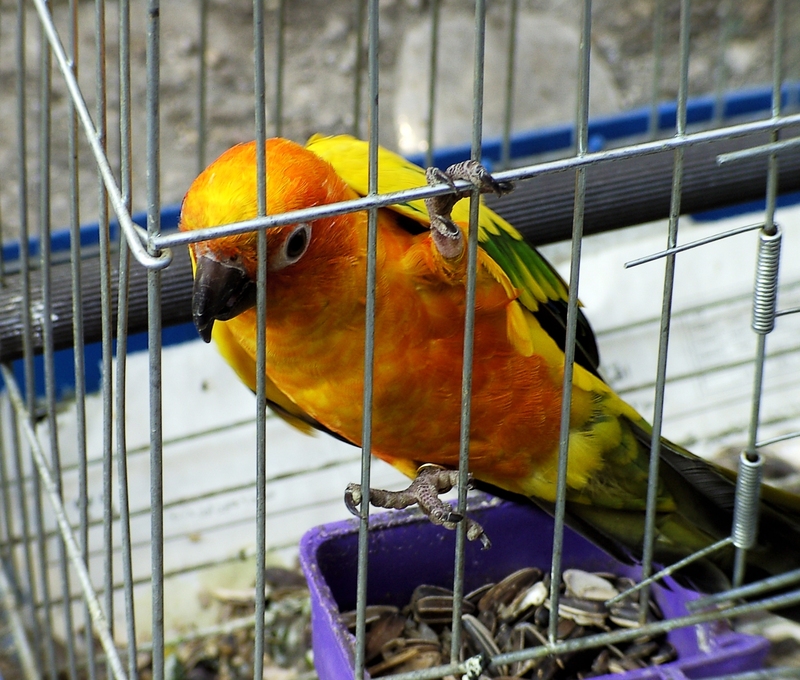 According to PETA, “There is no such animal as a “cage bird.” All caged birds were either captured or bred in captivity. In the wild, these beautiful beings are never alone. If they become separated from their flockmates for even a moment, they call wildly to them. They preen each other, fly together, play, and share egg-incubation duties. Many bird species mate for life and share parenting tasks. The evidence of their close companionship and concern for one another is plain to see. By the way, it is illegal to keep a native bird as a pet, injured or not. Federal law prohibits the possession of any birds or bird parts (feathers, eggs, nests, dead birds, etc). without the proper permits. See the Migratory Bird Treaty Act . Find an injured bird? Call your local wildlife rehab center or wildlife official.